Mark Rothko, the great American Modernist painter was famous for his colour field paintings – these were great, austere canvases with deceptively simple bands or tracts of colour and the 'Tate Modern' Museum in London even built a room to house his artworks, so impressive were they. 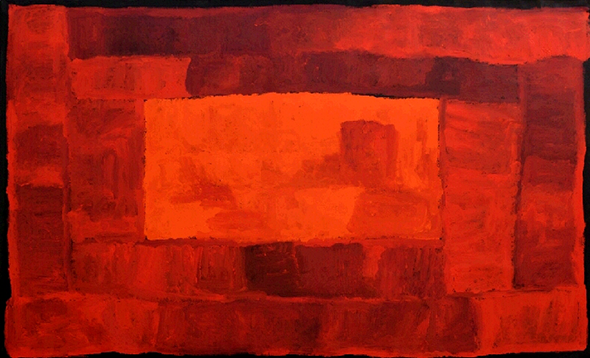 Kudditji Kngwarreye was the first Indigenous artist to paint in colour fields, back in 1993, but he didn't take his inspiration from Mark Rothko. The style wasn't welcome in the world of Aboriginal art back then, and he was encouraged to return to doing dot paintings, but in 2002 his work was met with a somewhat different response from afficionados of abstract art. Other indigenous artists have bordered on colour fields in their work, most notably his famous sister Emily Kame Kngwarreye, but none has achieved the sublime marriage of brushwork and colour evident in Kudditji's works, which now sell readily across the globe. 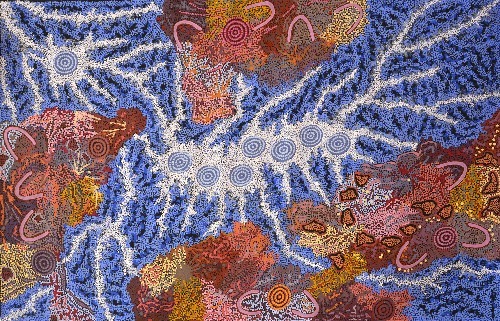 Abstract as they are, Kudditji's works, generally titled 'My Country', 'Emu Dreaming' or a place name such as 'Boundary Bore' are aerial views of the creation of his homelands in Utopia by the Emu Ancestors back in the Dreamtime.